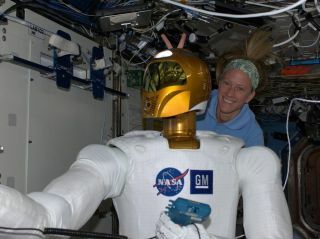 Aboard the International Space Station, astronaut Karen Nyberg indulges in a moment of levity with Robonaut 2. Image tweeted on June 28, 2013. A humanoid robot aboard the International Space Station is inspiring technology that could be useful to both astronauts and people on Earth. NASA's Robonaut 2, which arrived at the orbiting lab in 2011, has human-like arms and hands capable of performing simple tasks such as flipping switches and grasping objects. The robot was originally designed to do work outside the station, potentially reducing the number of time-consuming and strenuous spacewalks required of astronauts. First, scientists converted Robonaut into a full exoskeleton called X1 that can help astronauts exercise and stay healthy while spending long periods in space. But X1 also has potential application closer to home; scientists think paraplegia or stroke patients could use the skeleton to regain some lost motion here on Earth. NASA robotics engineers worked with researchers at the Florida Institute for Human and Machine Cognition to create the exoskeleton, which straps on over the shoulders and back and covers the legs. Motorized joints installed at the hips and knees allow the wearer to take halting steps. Demonstration of RoboGlove — spinoff technology from NASA's Robonaut program — providing assistance with a grasping task. Robonaut also inspired Roboglove, a glove designed with flexible tendons that can assist grip force. On spacewalks, astronauts must repair and maintain the outside of the orbiting lab. But zero gravity combined with a bulky spacesuit can make even simple tasks difficult. "Due to pressurization of the suit, it's like squeezing a balloon every time you move your hand," Lyndon Bridgwater, senior robotics engineer at NASA's Johnson Space Center in Houston, said in a statement. "That causes extreme fatigue and even injury. We're looking at putting the hardware and actuator in the glove itself to provide muscle augmentation for the hand." Finally, scientists think Robonaut could be useful for telemedicine. Tests at the Methodist Hospital in Houston have shown it's possible for Robonaut to guide a user's hand to stick a needle in a vein. In the future, scientists think Robonaut could assist astronauts performing medical procedures in space with doctors supervising from Earth. "The robot could stabilize an injured individual or do nursing-level work, even on Earth," Ron Diftler, Robonaut project manager, said in a statement. "That essentially transports a doctor's skill and presence to somewhere the doctor can't go or, in an emergency situation, where it would be dangerous for a person to go." Robonaut 2 has thus far been humanoid only from the waist up; it launched to the space station without any legs. But a pair of legs for the robot arrived at the orbiting complex aboard SpaceX's unmanned Dragon cargo craft in April, so Robonaut 2 will soon get quite a bit taller. Follow Kelly Dickerson on Twitter.Follow us @Spacedotcom, Facebook or Google+. Originally published on Space.com.